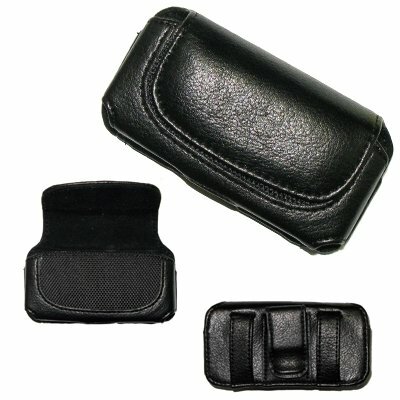 The Samsung Reality U820 executive black horizontal leather side case pouch enables you to safely carry your phone with you. Genuine leather and high-quality construction with black color stitching and sealed seams for durability and an executive look makes this Samsung Reality U820 executive black horizontal leather side case pouch a perfect match for your phone. The interior is lined with black soft neoprene fabric that protects your Samsung Reality U820 from minor bumps and shock, while the magnetic closing flap keeps your phone safe and secure inside the case. Fixed belt clip and belt loop lets you clip or loop the case onto your belt. Belt clip and belt loop holes allow for easy carrying on your waist. Finger hole in bottom of case for easy & convenient removal of your phone. If you have any questions about this product by Executive, contact us by completing and submitting the form below. If you are looking for a specif part number, please include it with your message.